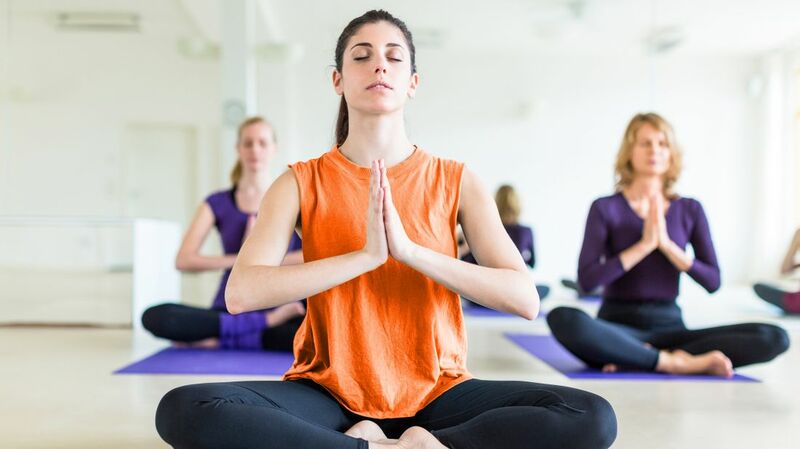 People get into yoga for different reasons, whether as an alternative to cardio, a way to unwind after a long week, or in some instances as a part of their belief system. No matter the reason for the practice, setting aside time in your schedule to quiet your thoughts and focus on your body offers benefits that extend to other parts of your life. Here are some science-backed reasons to break out your yoga mat. 1. IT GIVES YOUR BRAIN A BOOST. Even a single yoga session can improve your cognition. A 2017 study found that after just 25 minutes of yoga or mindful meditation, subjects performed better on executive function tasks, which include the ability to control habitual thought patterns and reactionary emotional responses. When people do yoga, they’re forced to quiet their minds and focus on the physical. This same mental skill carries over into everyday life: With heightened focus and mental control, people can push away distracting thoughts and devote their attention to the tasks that matter to them. 2. IT HELPS YOU EAT SMARTER. Yoga may not burn as many calories as traditional aerobic exercise, but it can help you get fit in other ways. According to a study published in 2009, people who practice yoga are more mindful of what they eat and of how what they’re putting into their bodies makes them feel. This deepened awareness leads people to make healthier choices when mealtime rolls around. 3. IT PROMOTES HEART HEALTH. Heart disease is the leading cause of death in the U.S., and adopting a regular yoga practice may help protect against it. According to a 2015 study, doing yoga reduces your risk of cardiovascular disease as much as other forms of exercise such as brisk walking. Researchers found that participants who took yoga classes lowered their blood pressure by five points and their LDL cholesterol levels by 12. A combination of the different elements that make up yoga—such as physical activity, deep breathing, and meditation—may explain the heart-healthy benefits. 4. IT MAY HELP FIGHT DEPRESSION. There’s no one-size-fits-all treatment for depression, but for some patients yoga seems to help. A study released in 2017 shows that subjects who took yoga classes for several weeks reported a reduction in noticeable symptoms at the end of the trial and in the months that followed. More research still needs to be done before doctors start prescribing yoga to their patients, but for now it may work as a supplement to more conventional treatments. 5. IT CAN REDUCE INSOMNIA. Have trouble falling asleep at night? Practicing yoga before bedtime may help get your sleep schedule back on track. For a study published in 2004, researchers had subjects suffering from chronic insomnia do yoga every night before getting into bed for eight weeks. They found that the study participants enjoyed longer and deeper sleep cycles after picking up a yoga routine. While insomnia is sometimes linked to a person’s genetics, yoga can be effective in alleviating the psychological causes. 6. IT EASES BACK PAIN. Millions of Americans suffer from back pain. According to a study published in 2011, some time spent on a yoga mat can potentially provide them with relief. Subjects with moderate back pain who started doing yoga on a regular basis reported diminished symptoms and improved back function after 12 weeks. Participants who did yoga also ended up taking less pain medication than those in the control group. 7. IT’S A MAJOR STRESS RELIEVER. Yoga is all about letting go of your worries and focusing on the now, so it should come as no surprise that the activity relieves stress. But research has shown that yoga does more than give you a relaxing break from daily life: It can actually change your gene expression. According to a paper published in 2017, yoga impedes the expression of genes that cause inflammation, which is linked to stress and certain diseases. So if you ever feel especially relaxed after a yoga session, that feeling may go even deeper than you realize. Getting started with yoga can require patience and perseverance. Luckily, ﬁnding the right credit card is easier. Discover Card automatically matches the cash back you earn, dollar for dollar, at the end of your ﬁrst year. Visit Discover to learn more.